Chieftain – A mid-season maturing, high yielding potato that is oblong-to-round with smooth red skin and nice white flesh. Good for boiling and frying. Stores well. Gold Rush – A mid-season maturing starchy variety. Attractive oblong-to-long tubers with smooth russeted skin and extremely white flesh are delicious for baking and frying. It produces high yields and is resistant to drought. 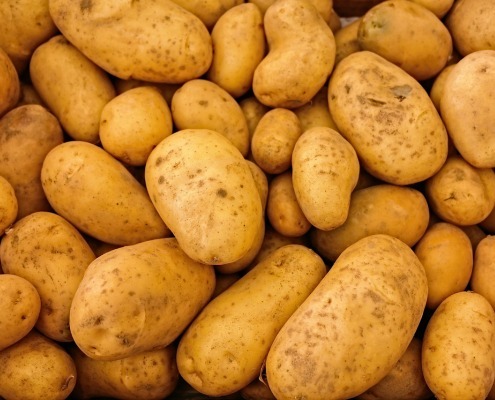 Katahdin – A main season maturing starchy variety with a smooth skin and yellow flesh with a classic potato flavor. Its fluffy, creamy texture makes it best for French fries, baking and boiling, but not good for potato salads. 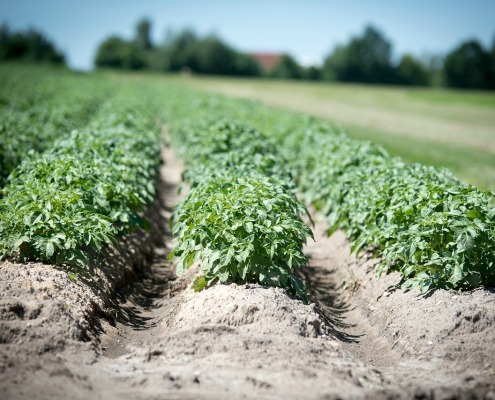 Kennebec – A mid-season maturing all purpose high yielding potato. Its thin skin makes for easy peeling. Your classic chipping variety that also works well for French frying, baking and mashing. Holds its shape, making it ideal for salads. Lehigh – A less than 10 year old all purpose variety named for the Lehigh Valley. It is a mid to late season high yielding potato with yellow flesh and round shape that won’t fall apart when boiled yet great for baking and frying. A blue ribbon winner at the fair! Red Norland – An early maturing red skinned waxy round potato with great taste and various sizes. Holds shape when boiled yet great for baking, mashing, chipping and frying. Red Pontiac – A late season, red skinned all purpose potato with very sweet white flesh. Thin skin makes a great “new” potato. Keeps well. One of the easiest and most adaptable red potatoes there is to grow. Also great for mashing. Superior – An early season medium-sized and yield, all purpose round, white potato that stores well. Holds shape when boiled yet great for baking, mashing, chipping and frying. Yukon Gold – A mid-season all purpose potato. An oval, slightly flattened variety with a light yellow flesh and sweet taste. It has a waxy texture and moist flesh which makes it best for boiling, baling, grilling, roasting, pan frying and French frying.